Here’s a pop quiz for you. Multiple answers are possible. Not sure about the answer? Read the story of Fiat TriVette to find out. The 1970s were a tumultuous decade in the United States. Inflation, recession, stock market crash, oil crisis. You name it. But let’s delve into the oil crisis a bit. 1973 Oil Embargo severely strained the US economy that had grown heavily dependent on foreign oil imports. The decision to boycott America led the price of crude oil to rise from $3 to $12 per barrel by 1974. As a result, the price of gas skyrocketed and the availability of the latter drastically decreased. Politicians called for a national rationing program. When then-President Nixon asked gas stations owners to stop selling gas on Saturday nights or Sundays, 90 percent of owners complied. The outcome: long lines at the filling stations. What could Americans do? Everyone loved large and powerful gas guzzlers.By 1971, V8 was the standard engine in the Chevy Caprice, and Chevy Impala wouldn’t achieve more than 15 highway miles per gallon. With the oil crisis, Americans could no longer afford the big cars. The country needed to act to contain its future dependency on foreign oil. In 1975, Congress passed the new fuel economy standards raising mileage from 13.5 mpg to 27 mpg. The government also threatened to put more tax on fuel so that people would need more fuel-efficient cars. A new market for smaller and fuel-efficient vehicles opened up. Detroit couldn’t react to the situation overnight, so an outbreak of experimental mini cars started to spread across the country. Backyard inventors and seasoned engineers alike, all wanted to do their part and contribute to finding a viable solution to the oil crisis. While con artists were simply looking for ways to make a profit. The 1970s had become the decade of eccentric inventions, unfulfilled promises, and fraudulent schemes. Bob Keyes and the Idea of TriVette. Bob Keyes was no backyard inventor. He was a physicist with many years of experience in Aerospace and Defense Business, who worked on anything starting from flight simulators to assembly line robots. And, he was determined to give the world a new fuel-efficient vehicle. Thus, the idea of TriVette was born. Keyes looked into statistics according to which 93 percent of all vehicles (at least on California freeways) had only one occupant, the driver. A 3500 lbs vehicle on average carried only 180 lbs. Not much efficiency here. And the situation mustn’t have been very different in other parts of the country. Bob also understood, that given the circumstances, the requirements for the new car would be demanding. The car’s cost had to be low due to inflation and recession. It also had to be very efficient due to fuel shortage. It had to be practical and reliable. And the parts had to be cheap and readily available. Bob Keyes looked into 4-wheels, 3-wheels, and 2-wheels configurations. The vehicle had to be light with a low center of gravity and the weight concentrated at the end of it. So the choice was obvious: 3-wheeler it was. The TriVette was designed to carry a driver in a fully enclosed vehicle and one passenger. It featured a heater and an optional air conditioner. Most of the parts, including the engine and drivetrain, were taken from Fiat 850. With TriVette, you could easily get 68 mpg driving on a highway and 55 mpg on city roads. State and Federal laws classified it as a motorcycle. TriVettes were hand built on a custom order basis at a factory in Ventura, California between 1974 and 1978. How was TriVette different from other 3-wheelers? Most 3-wheeled vehicles are a conversion of a motorcycle; hence, their handling capacity is not the best. But TriVette’s creator proved that good engineering and respect for the unavoidable laws of physics could result in a very stable 3-wheeled vehicle with excellent handling abilities. TriVette’s aerodynamics generate large down forces, hence the stability increases with speed. The vehicle’s center of gravity is low and close to the two rear tires, which helps to handle transverse cornering loads. When it gets to the physics, it is similar to the weight and balance proportions used when designing light aircraft. 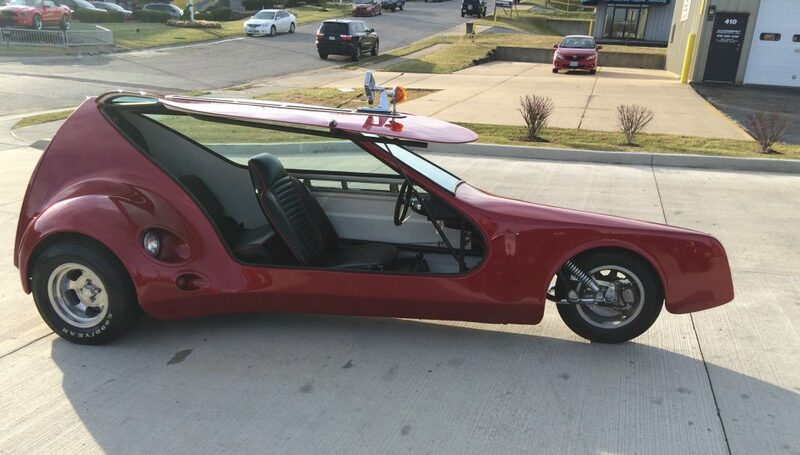 And, hey, you won’t deny it, TriVette looks like a jet fighter, just add the wings. By the way, jet fighter similarity doesn’t end here. Once you get inside the car, you’ll be faced with an array of instruments in a semi-circular pod. TriVette caught the eye of the California Highway Patrol Office. They needed a high-speed fuel economical pursuit vehicle. And their Dodge Diplomats and motorcycles were limited to 105 mph. No way they could catch up to Mustangs and Camaros. All TriVette creator had to do was turbocharge the vehicle, so it could reach 160-165 mph. Police officers loved the idea of a car chase in a super-hero like vehicle. Unfortunately, the California Highway Patrol Office opted for a high-speed but more conventional Ford. The Vigillante and the Trivette Two. People seemed to love TriVette, but for some, it wasn’t powerful enough. Given that legally it’s a motorcycle, hence not a subject to smog regulations. You could do whatever was legal in your state to power up the engine. Or you could ask Bob Keys to build a Vigillante for you – The World’s Quickest Steet-Legal Exotic, as Bob himself called it. The Vig could do 0-60 mph in 3 seconds and had a top speed of 200 mph without compromising its stability. The price tag of $125K might have been a bit of an obstacle. Still much more affordable than a Lamborghini or Ferrari, or any other of those supercars. To offer a powerful vehicle at an affordable price, Bob Keys came up with an idea of the TrivetteTwo. The car was offered in a kit form to keep the costs down. 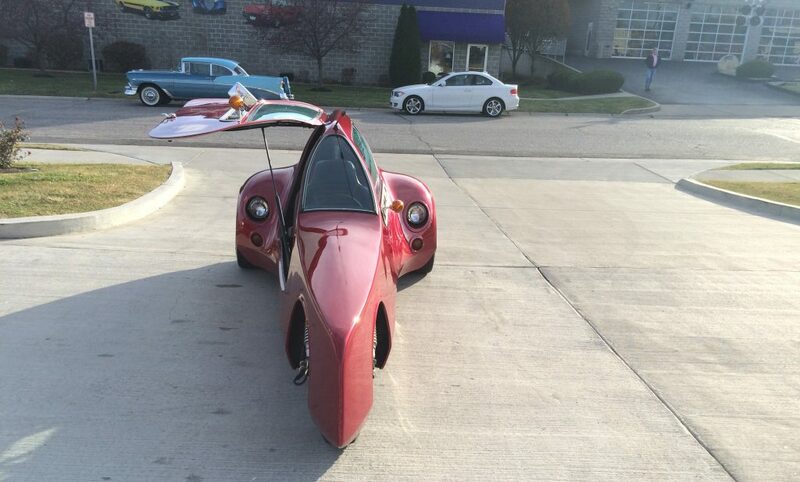 The kit price started at $12,500 and included all the necessary parts sans the donor vehicle. The cost of a donor vehicle was calculated at approximately $2500. Hence, for $15K you could own a high-performance fuel-efficient, practical, and very cool looking vehicle. Unfortunately, TriVettes didn’t get much attention. A total of 27 vehicles had been manufactured. The government never implemented much-dreaded fuel tax, and little by little Americans went back to their gas-guzzling 4-wheeled fatties, forgetting about small TriVettes. Corsia Logistics got to transport one of those quirky TriVettes. The idea of transporting one of only 27 cars ever made, makes us feel quite special… and proud. Shipping the TriVette meant shipping a part of the American history – quite a responsibility. In return, we got to see one of the most exciting vehicles in person! 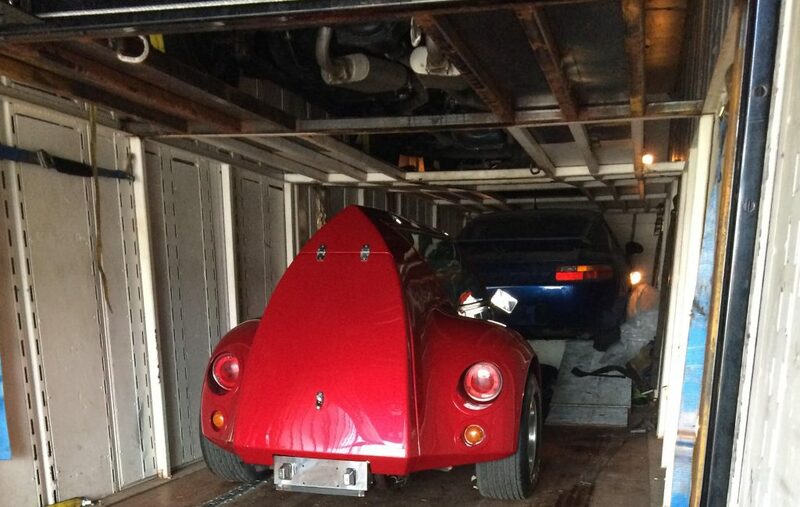 If you own a vehicle as special as TriVette, you would want to double the amount of care to ship it. That is exactly why this particular model was shipped via enclosed carrier. The biggest advantage of enclosed auto shipping is that it ensures protection from weather conditions and road elements. Hence, gives you an extra peace of mind. It’s a bit pricier not only because of extra protection but also due to less availability of the enclosed fleet. If you need to move your very special vehicle, anywhere in the country, we at Corsia Logistics would be thrilled to take on the task. You can get in touch with us by calling (818) 850-5258 or chat with us online. Do you own a rare vehicle? We’d love to hear your story.